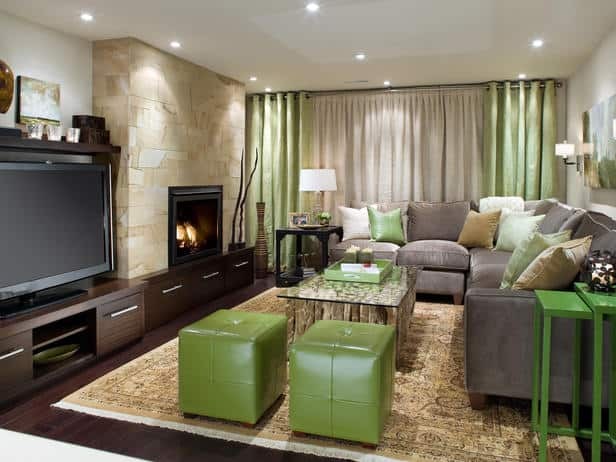 Let’s talk about focal points in room design – specifically in our living spaces such as living rooms and family rooms. You know that thing that your eye automatically goes to when you enter a room? That thing can be a fireplace, large window, built-in bookcase, a large furniture piece, even a big ole blank wall. Sometimes it’s easy to identify what the focal point in a room is or should be. And sometimes, not so easy. What if your room has multiple focal points? That’s exactly what I want to talk about here. How in the world to design a room with multiple focal points that you’ll be happy with. The room below has a large window, a fireplace and a large piece of furniture all in one area. Any one of these features could be considered a focal point on it’s own, but with them grouped in one spot and with nothing to draw my eye, I don’t know where to focus my attention. In spite of the lovely furnishings and accessories, the room has an unsettled feel to it. Every room and situation is different, but here are basic guidelines for dealing with multiple focal points when designing your living space. 1. Choose the element you most want to draw attention to. Choose wisely because remember, this is where the eye of you and your guests will go. Do you have a large window – say with beautiful moulding that you’d like to highlight? That’s wonderful, but make sure there’s a lovely view outside of that window before you take steps to invite attention to it. How about a fireplace? Before making it the main focus, make sure it’s clean and in good repair. You’ll also want to consider the main use of the space. Is it for watching tv? Lounging and reading? Entertaining? Each of these would likely impact what you choose as your main focal point. 2. Take steps to draw the eye. Now that you’ve decided what you want the main focal point to be, there are several “tricks” you can use to emphasize the area. 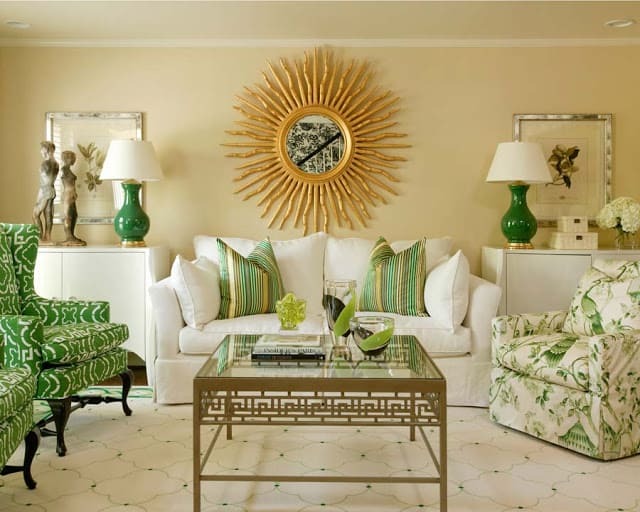 *Arrange the furniture so that the largest pieces are facing the main focal point. *If the furniture can’t face the focal point, then arrange it in such a way that it “leads” the eye where you want it to go. *Adding pops of color in pillows, art or accessories will draw the eye. *If a window will be your main focal point, use fabric for the window treatments that has some color and/or a lovely pattern. Decorative trim will also help to draw the eye. *Paint the wall where the main focal point is located an accent color or add wallpaper or stenciling just to that one wall. *Tone down the secondary focal point(s) by softening it with the use of paler colors, simple patterns and/or smoother textures. *If the view out of that fabulous window isn’t so great, use simple window treatments with clean lines and soft colors. 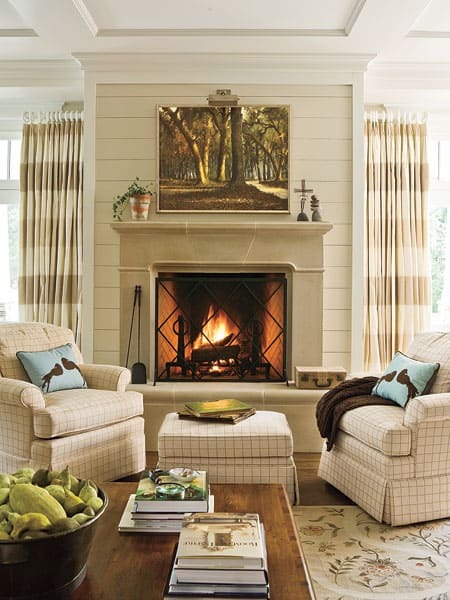 *If you aren’t trying to make the fireplace the main focal point, keep artwork, accessories on the mantle and hearth simple and to a minimum. Same goes for bookcases. *If you have a situation where there is a built-in entertainment center right beside a fireplace, consider painting the secondary focal point the same color as the walls. 4. More tips on furniture. *Create multiple groups of furniture within the room. Use the largest pieces around the main focal point. Use fewer and smaller pieces grouped together at or near the secondary focal point. Such as a smaller pair of occasional chairs flanking a fireplace (the secondary focal point) with the couch and larger pieces turned toward the tv (the main focal point). *A room with multiple focal points won’t feel as busy if a monochromatic color scheme is used between the walls and large pieces of furniture. *If the fireplace and tv are on walls that are opposite of each other, consider using furniture pieces that swivel or are lightweight enough to be turned around. I hope you’ve found these tips helpful! If you have this situation in your home, I’d love for you to share how you dealt with it. 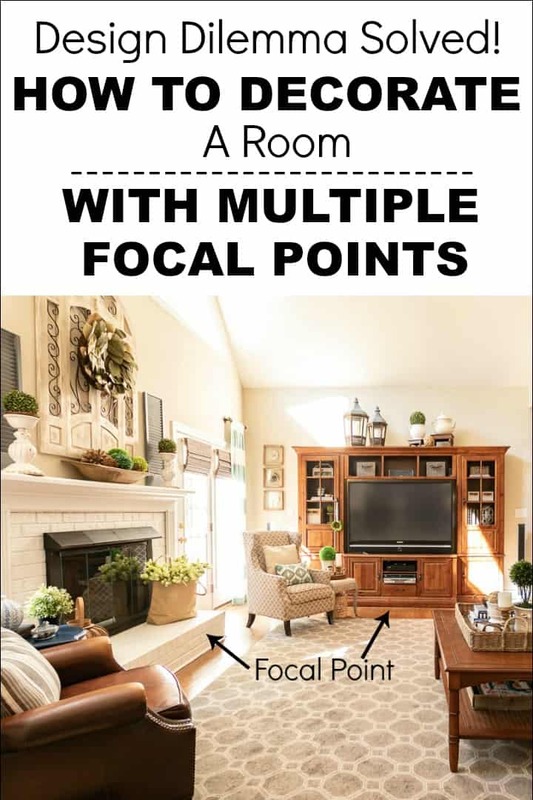 Thank you for some clarification on this…I have multiple focal points and it gets a little confusing on which space should be the ideal focal point. Good suggestions! Great tips! I’ve been trying to make my living room mantel more of a focal point…just finding it hard to find the right art and accessories. Great post Suzy….Love Candice…she’s rock star! Such a useful post and great great images. I especially liked that Tori Fairley. I am seeing her stuff everywhere lately. She has probably been around but now that I have discovered, and fallen in love with her style, I feel like she may be my new muse. 😀 Thanks for sharing on BeColorful I learned a lot. Wonderful and informative posts. Beautiful inspiration images. Clicking to Follow on Linky. 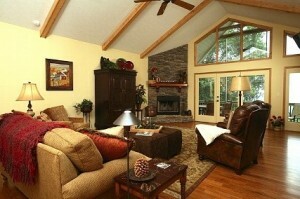 All are great tips, especially in dealing with a large room with multiple focal points. Thanks for sharing your tips at Potpourri Friday! Suzy, what a great post! I love all of Candice’s rooms! She’s awesome! These are all great tips. Multiple focal points make my family room hard to decorate since we have a wall of windows, a fire place, and of course a tv. Even a decorator from a furniture store couldn’t really offer much help. I’ll have to read your ideas further to get some good ideas. Thanks for linking up to Your Cozy Home Party this week! I love your tips. We have a fireplace in our living room, a big TV, and a wall (20′) of windows looking out to a view. We went with a pretty symmetrical arrangement of furniture in a square so there is always something facing either the fireplace or the view. Then we wall mounted the TV and it folds back to blend in. I used your ideas without even knowing! Great tips. I’ve been moving art around today, trying to get a new look. Thanks for the inspiration. I just found you via At The Picket Fence and I am your latest follower. Great post. I have a similar situation in our family room. 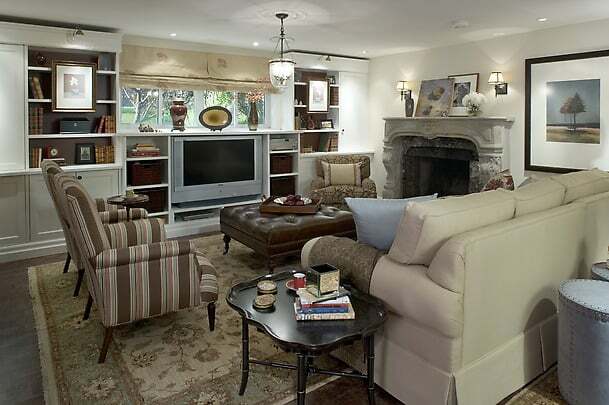 The fireplace is on one wall and the TV wall unit is on the adjacent wall. The truth is that the room is used for our family to watch TV together and hang out so the fireplace is my secondary focal point. It’s definitely tricky. Your post is full of great information. Oh goodness! So many pretty rooms! Thanks for all the great ideas and tips! I love the room with the TV armoire BESIDE the fireplace. Didn’t think to do that but it works so well! This is a great post! I went through this challenge with my family room. I think I ended up coming up with a pretty good solution, but it’s very hard to make it work. This is a very good article and I enjoyed the pictures. Such a good post, I’m now a follower. Blog layout is wonderful too. Looking forward to many more visits. Awesome posts with great tips Suzy! Thanks so much for sharing this with us at Inspiration Friday this week! I have 3 focal points but arrangement is totally different than any of these photos. I don’t know what to do. Glass doors/windows to left, large entertainment center front, and large fireplace to right with traffic area. Help!!! Any suggestions greatly appreciated! Understand undoubtedly that that’s a important point. In a solar panel you get the silicon surrounded by a protective material and the two are framed in a metal frame. However, these roller shades are fire retardant and are awesome options for apartments, condos, offices, and other business establishments like bakeries, banks, etc. Thank you for posting this. I have such trouble arranging furniture. I will definitely try the graph paper method. I am lucky/unlucky enough to have a den with only 1 full wall and 1/2 wall. The full wall has our tv over the fire place and a built in shelving unit on 1 side which leaves me with a blank wall on the other.